Hayate Ayasaki had been working since he was nine to pay off his degenerate parents' gambling debts. Before they disappeared, those parents sold their son’s organs to the yakuza to cover their debts. Hayate was working various part-time jobs to pay off the debts when fate brought Hayate to teenage heiress, Nagi Sanzenin a/k/a “Ojô-sama.” She is the frequent target of kidnapping plots and of various schemes by people trying to get her money. Hayate becomes Ojô-sama’s butler, zealously protecting her, while she falls in love with him. As Hayate the Combat Butler, Vol. 27 opens, Hayate is trying to move Tama the Tiger (which Ojo-sama thinks of as her pet cat) into the new boarding house where they live and operate with friends. Katsura Hinagiku's arrival complicates things, because there are feelings between the two. Ojo-sama decides to become a manga artist. Fortune brings her into contact with wildly successful manga artist, Goji Ashibashi, the creator of “So Melancholy About This and That.” Although her new “career” gets off to a rocky start, Ojo-sama decides to attend a doujinshi (amateur comics) convention with Hinagiku. Comic Sunday a.k.a. “ComiSun” turns out to be something of a revelation, but it also offers conflict and new rivals. 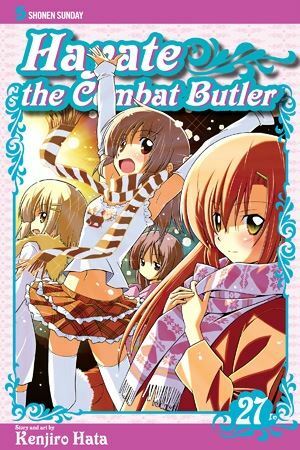 THE LOWDOWN: My love affair with the Hayate the Combat Butler manga continues. Will you marry me, Ojo-sama? Hayate, can I still be your ride-or-die chick? Do you still enjoy me surrendering to your many charms and relying on your capable butler arms? Seriously, Hayate the Combat Butler Volume 27 is another great volume of a superb shonen manga with a shojo heart. This send-up of manga and anime culture has a winning cast of characters, an ensemble for the manga ages. That is to say nothing of the guest-stars and reoccurring players; they always add something extra to a manga that rarely needs something extra. Hayate the Combat Butler is a manga I will fight for and will recommend.